AST Level 2 Course This 4 day course expands on the components of the Level 1 Course. 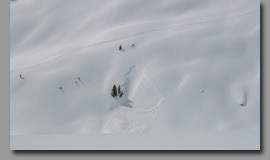 The extended format allows for more time in the field and is intended to provide a more comprehensive understanding of travel in avalanche terrain. The AST Level 1 is a recommended prerequisite for the Level 2 course. 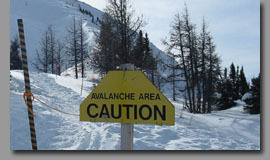 Click here for more information from the Avalanche Canada website. Cost includes instruction, course text book, Avaluator reference card, certificate of completion and applicable taxes. Please contact us for individual bookings. There is often space on an exisiting course. 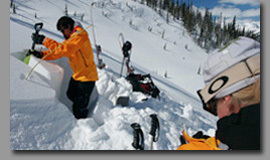 Backcountry courses are based at venues such as Rogers Pass or Kootenay Pass. This type of course is recommended for folks who have some ski touring experience and are looking to sharpen their backcountry skills. 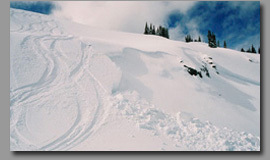 Ski Area courses take place at the Whitewater ski hill (20 minutes from Nelson). These courses are geared for slackcountry riders looking to explore beyond the area boundaries. Booking & Dates Courses start in early December and run throughout the season. Please contact us to discuss booking specific dates. 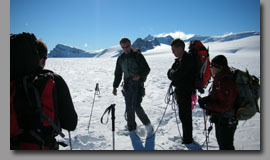 All participants are required to have an avalanche transceiver, shovel and collapsible probe. Rental equipment can be arranged if necessary. In addition, backcountry course participants will require alpine touring or telemark equipment or a split snowboard with skins. 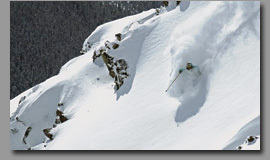 For those who are new to the backcountry or looking to sharpen their skills we offer backcountry performance clinics. With a combined focus on safe travel techniques and quality descents this full day course is designed to cover the fundamentals of touring and help develop competence in the backcountry. All clinics will be tailored to the participant's experience level and interests. Prices start at $125 per person based on a group of four. Almost any outing can be tailored to create a more educational experience. If you are new to an activity or want to work at improving your skills in the mountains we can help. Introductory glacier travel and mountaineering courses are a great way to enjoy the mountains and learn something at the same time. Please contact us to discuss your unique requirements. Dates for all courses are flexible so we can adjust to fit your schedule. Click here for booking information.